For centuries needleworkers have embellished cloth by adding layers of fabric in pictorial designs of religious and folk art themes. In renaissance Europe this technique was considered a form of embroidery, known as “intasia” embroidery from the Italian for “inlay”. 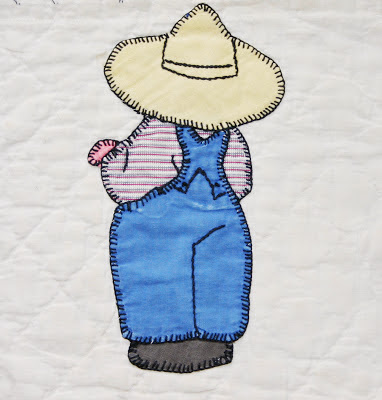 In American quilt making tradition, initial appliqué was termed Broderie Perse (Persian Embroidery) in which elements were cut from printed chintz fabrics and sewn onto a plain ground. At times, borders were decorated with designs cut from scraps of plain or small-print cloth. This would become the definition of American appliqué where entire designs were created from small pieces of overlaid fabric or “patchwork”. 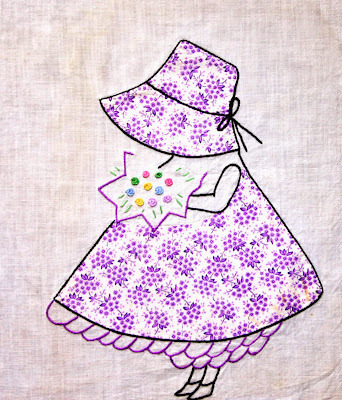 Applique embellishments were popular for garments and household linens. As with all trends, rises in popular techniques are often followed by declines and by the end of the 19thC “piecework” in which fabric “pieces” were sewn together to form units became popular. These units were then joined to form the quilt or garment. This was further augmented by the increasing popularity of purchased commercial patterns and quilt kits with pre-cut shapes ready for stitching. By the 1920’s appliqué was back, due in part to the production of colorful small-print Amercian-made fabrics. At this time, also, arose children’s décor with quilts, linens and china created just for the small ones in the family. Prior to this, many of these items were simply smaller versions of full-sized adult products. 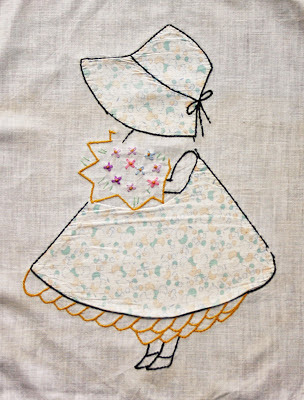 Now we come to Sunbonnet Sue. 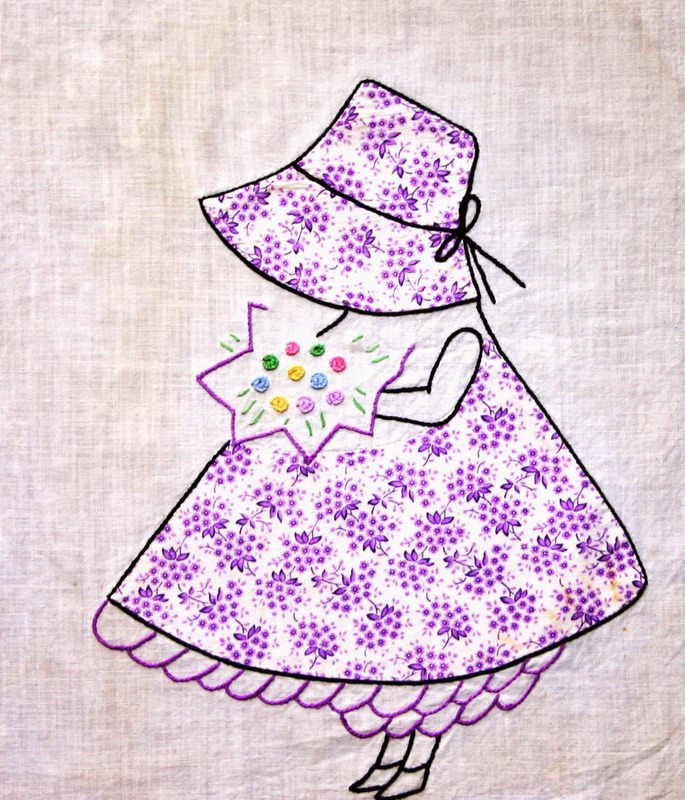 There were early versions of this design, these versions were actually outlined embroidery. 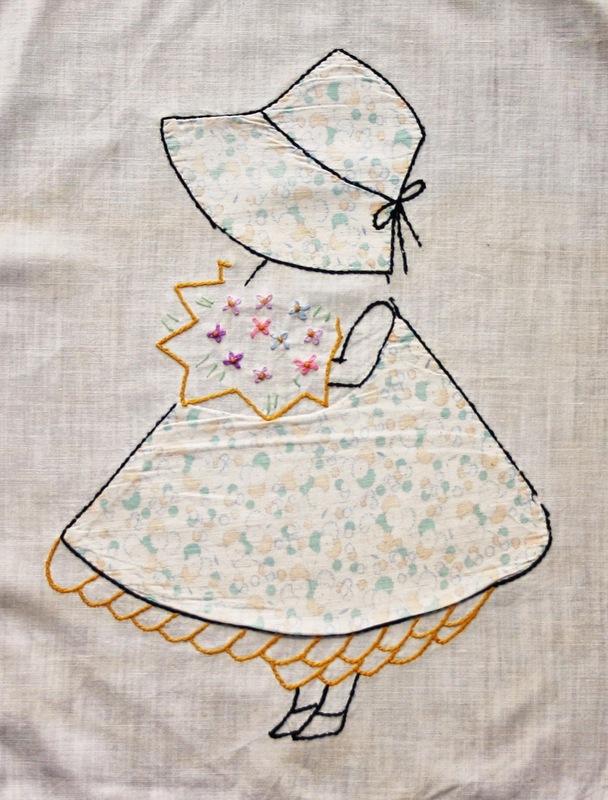 In 1910 Sunbonnet Sue first appeared as a pattern for an appliqué child quilt. 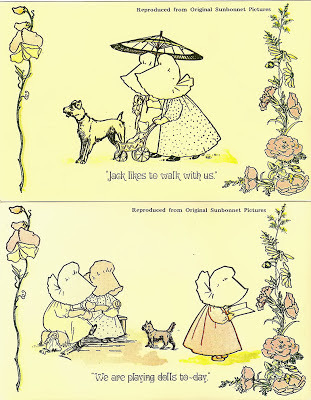 The design for this bonneted little girl came from the postcards and books by British illustrator Kate Greenaway in the late 1800’s. 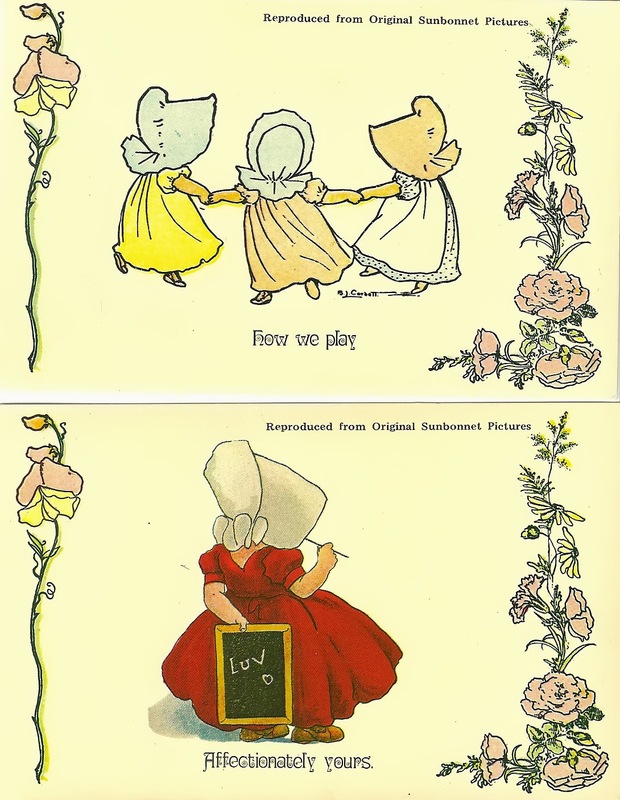 In America, Bertha Corbett published The Sunbonnet Babies Primer in 1902 from which many, many first graders learned to read. Post cards reproduced from original Sunbonnet Pictures. 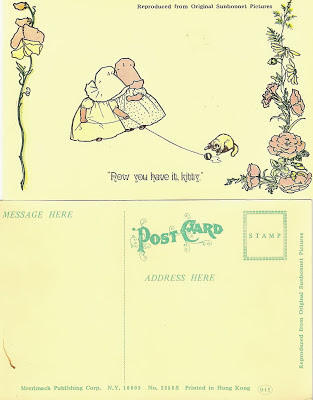 Merrimack Publishing Corp., N.Y. There have been hundreds variations of this design, including a small boy companion called Sam.